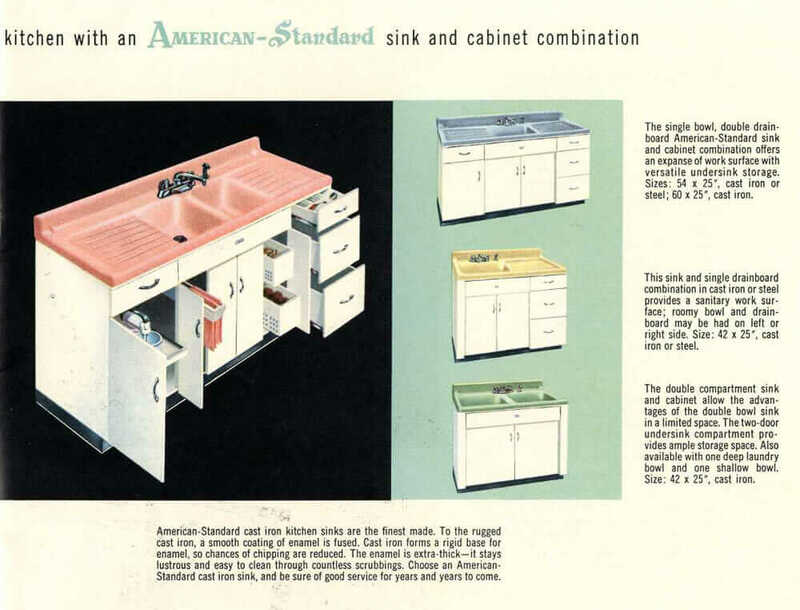 American-Standard– well-known among vintage home enthusiasts for its gorgeous early- and mid-20th Century sink and bathtub designs — also made its own line of steel kitchen cabinets. I tend to believe these were not as popular as the biggest brands, namely Youngstown, Geneva and St. Charles, and in fact, I believe that later, American-Standard bought out Youngstown. 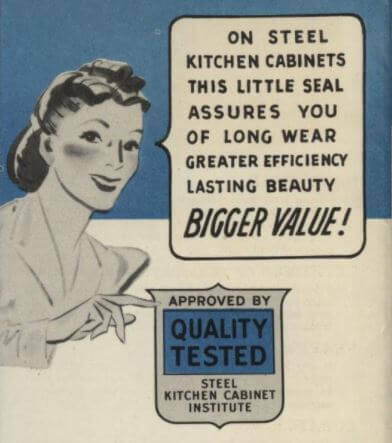 I’m rededicating myself to working on my Retro Renovation Encyclopedia of Vintage Steel Kitchen Cabinets — 86 brands identified! 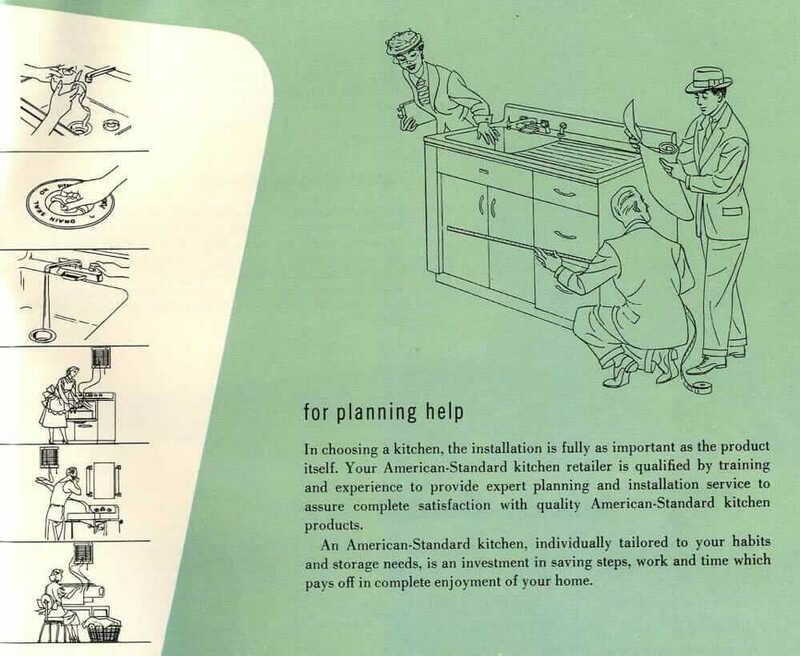 So today, here’s a 1953 American-Standard steel kitchen cabinets brochure from 1953, showing us what the cabinets looked like at the time. 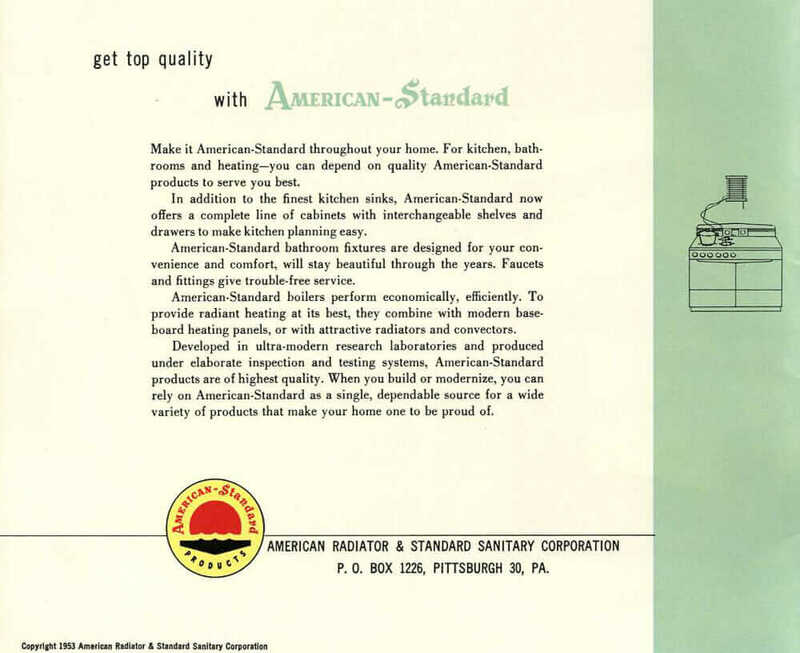 I don’t know the history for sure, but I think there was first and “American Radiator” aka “American” company, that then merged with Standard Sanitary Corporation.” The earlier “American” also had a brand of steel kitchen cabinets, which can be seen in my 1938 catalog. 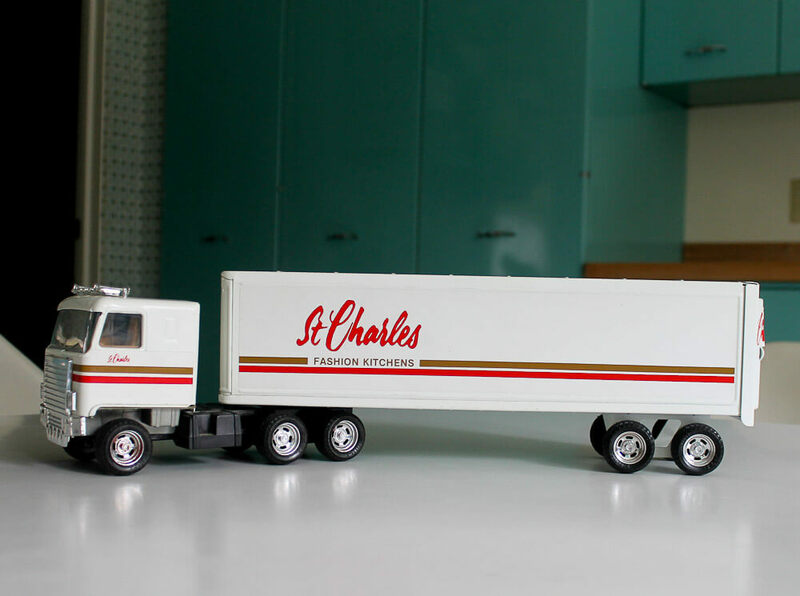 Photo viewing tip: Once the page has fully loaded, click on a photo and it should enlarge on screen up to 1000 pixels wide. 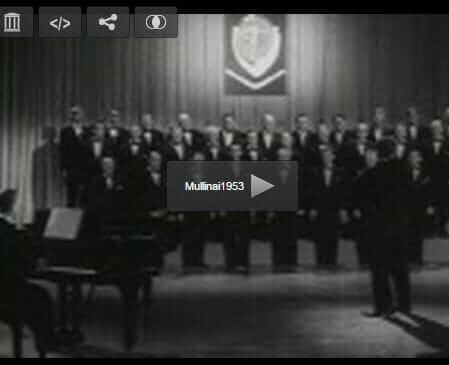 Hit the back or ESC button to get back to the story. 1953: The kitchens were so… classic! 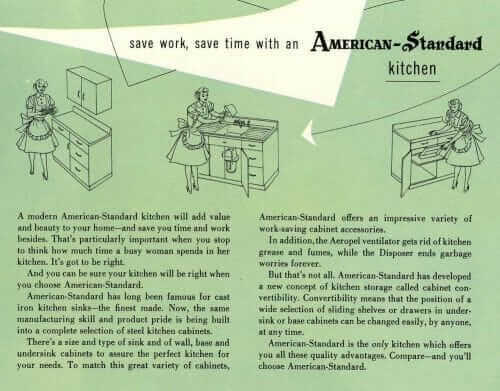 Like other brands of steel kitchen cabinet makers, American-Standard seems to play up the idea that you could start with just a sink cabinet, and add additional base and wall cabinets as you got the money. 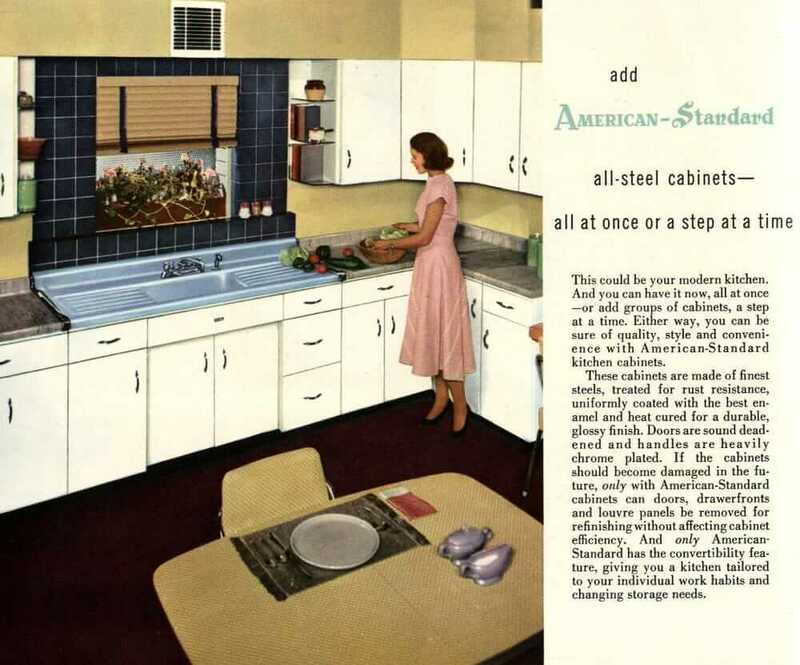 Or, you could buy just the steel sink+base combination and use wood cabinets in the rest of the kitchen. Above: The American-Standard Midway sink is pretty darned amazing. 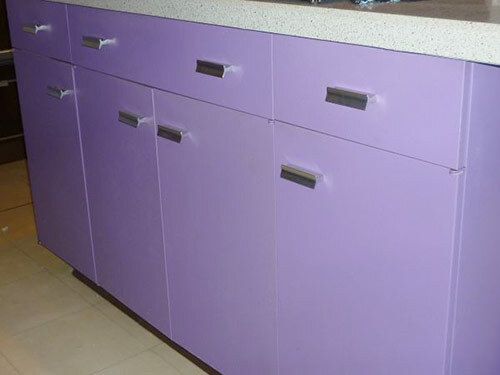 Means to sit on a specially designed steel-cabinet island, it has a drainboard on one side and two sink bowls on the other. I’ve never seen one of this in wild. 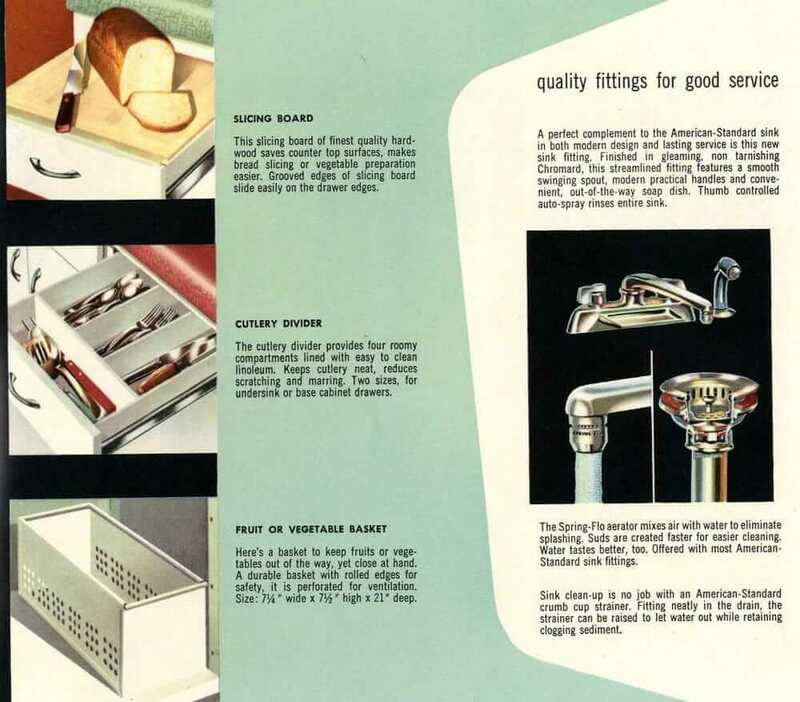 Above: Some more interesting sink designs here. 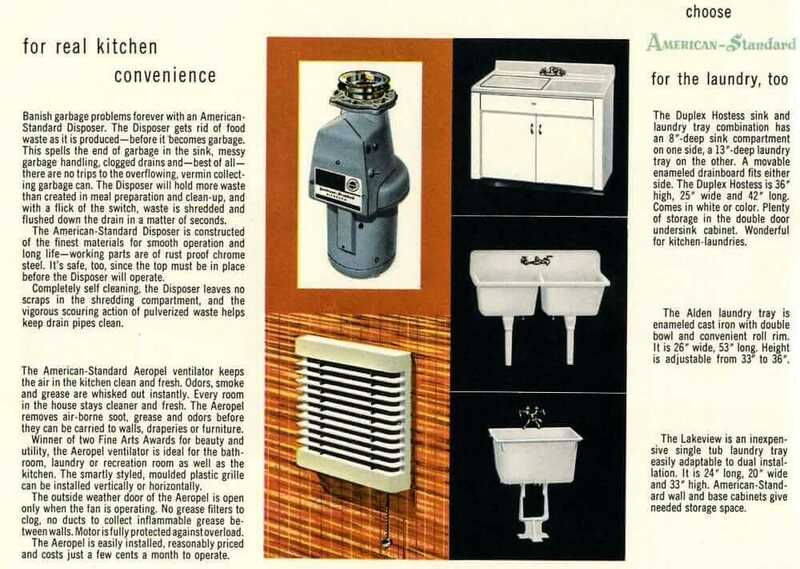 Above: Of course, these photos are always great to examine for design details. That’s why I originally started collecting these brochures. I this one, Notice the interesting use of ceramic tile above the sink only. 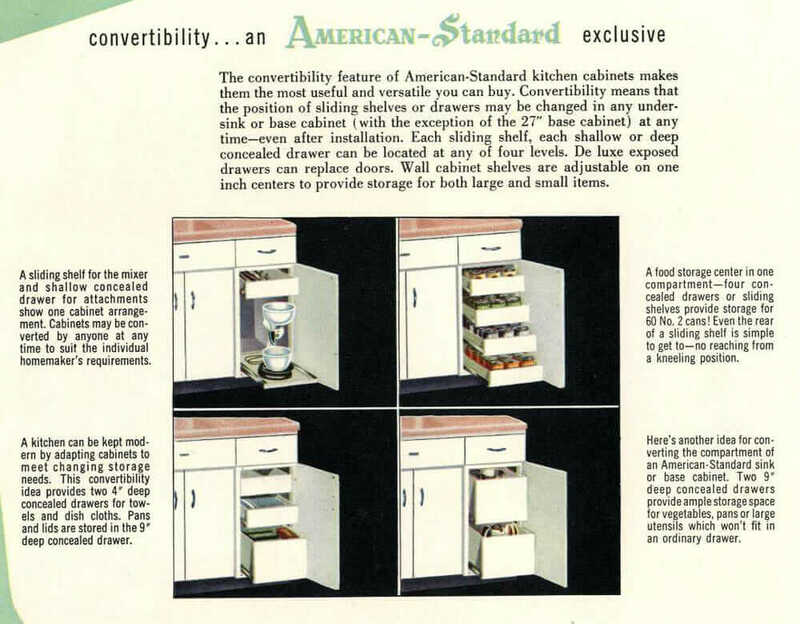 American-Standard’s design looks like may other manufacturers’: Full overlay doors, chrome handles. Such a pretty color combination! The brochure says that the company offered Micarta-brand laminates. 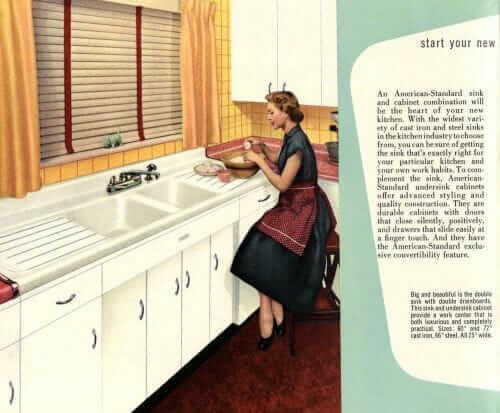 Micarta was owned by Westinghouse, according to my research. 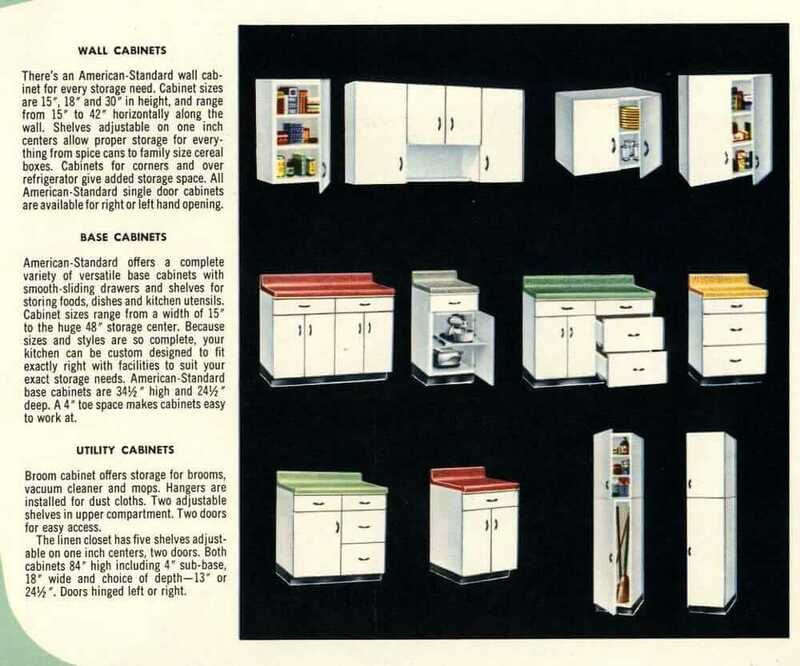 The best way to know what brand your kitchen cabinets are, is if there is a logo somewhere. Duh. 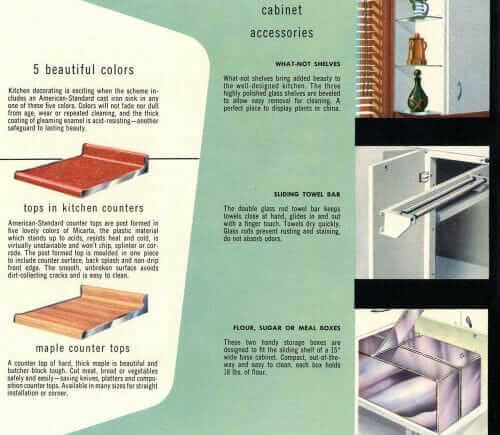 But if not, sometimes we can tell by (1) the overall design, by (2) the cabinet pulls, or by (3) the shelving and pull outs. However, these need to be differentiated enough to know for sure. 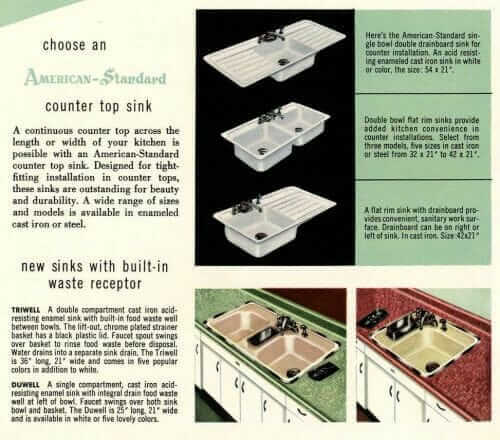 Want to break up a long line of laminate countertop? Add a piece of butcher block! My Encyclopedia of Vintage Steel Kitchen Cabinets. 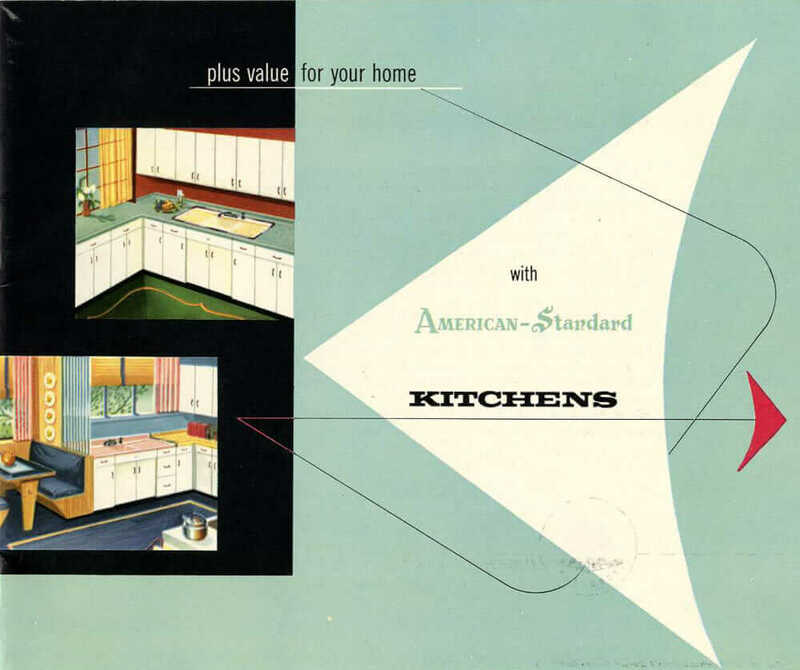 I still see islands with sinks in them in larger kitchens, though usually only one sink and a small one at that. 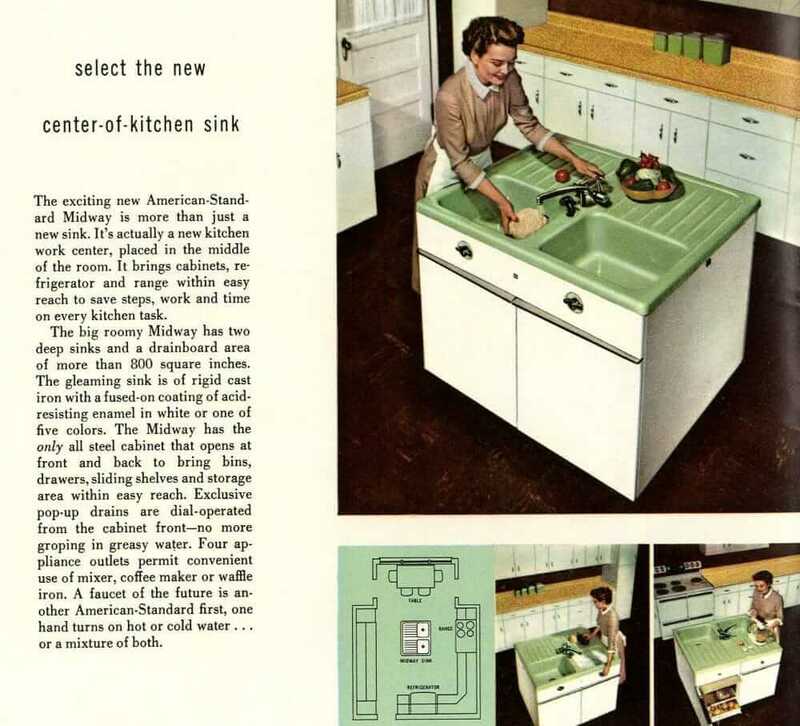 Neat as the midway island is, I don’t think having the only sinks in the kitchen in the island would work very well. 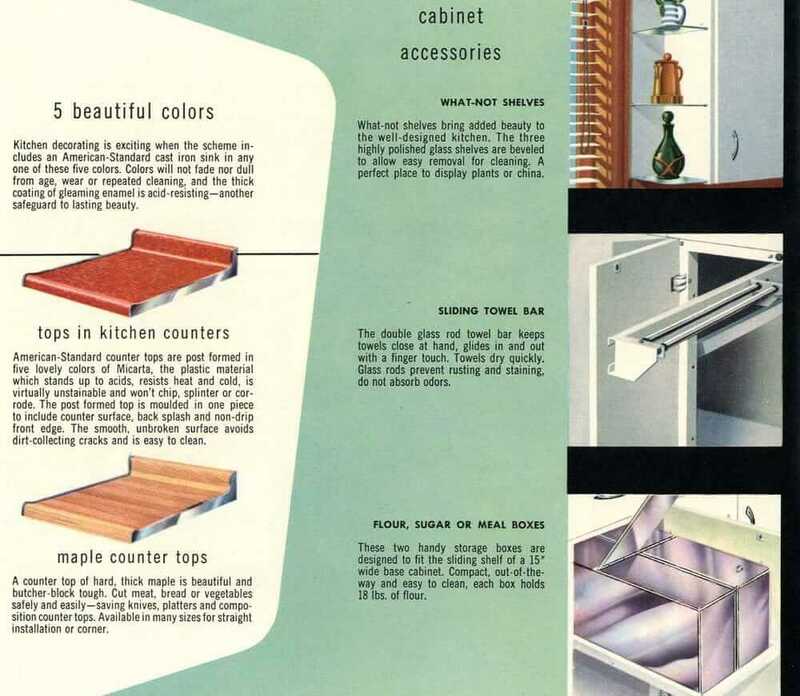 Many of the cabinets here have a feature I see often in ’50s kitchens that seems to have disappeared by the ’70s – base cabinets under the sink area that are recessed a few inches from those surrounding them. What was the intent of this design, and why did it fall out of fashion? 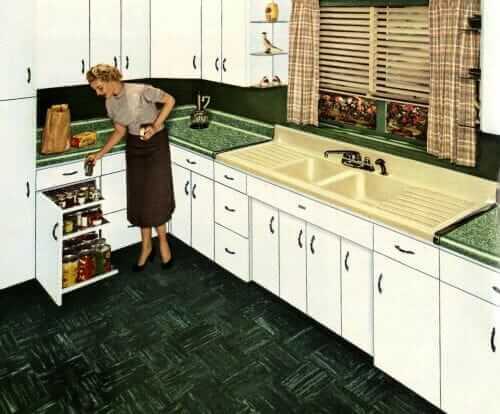 I tend to think the recessed doors were because the Mrs. would stand at the sink cabinet and do dishes, etc. Gave her more standing room…. 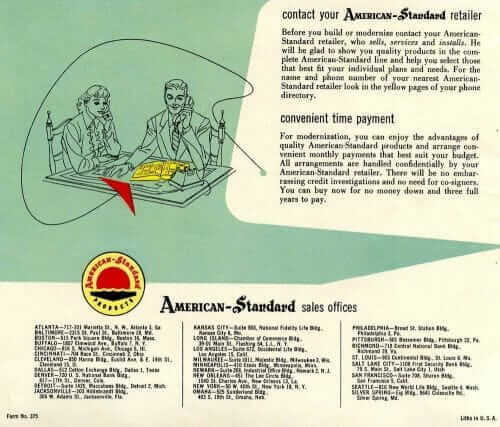 This is an educated guess, though — I’ll keep an eye out to see if, in one of my brochures, they explain it.